Putting aside the bathroom-door silhouette and that circle with an arrow sticking out of the top, what kinds of images might you use to represent "man"? A car? A barber pole? A cigar, perhaps? 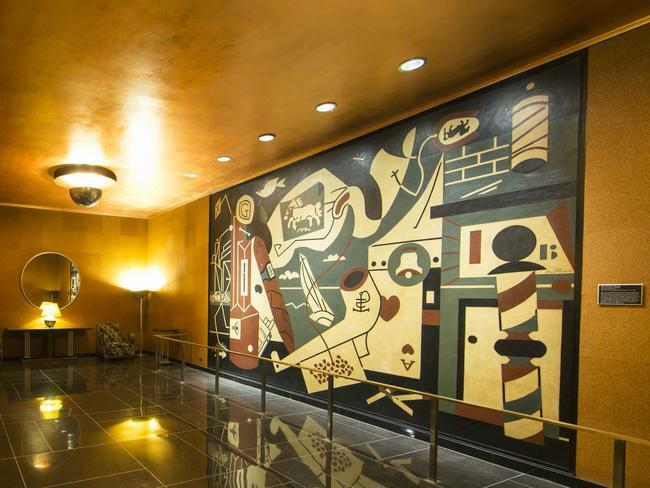 Artist Stuart Davis uses all three of these—plus a pipe, a playing card and a pack of cigarettes—for his Cubist tour de force “Men Without Women" (pictured), which hangs in the downstairs men’s lounge at Radio City Music Hall. The gentlemanly symbols at play in this dynamic, collage-like mural might strike you as retro, with even a Jazz Age echo, but this was 1932, and Davis was pulling from the visual cues of his time. By the look of Stuart Davis: In Full Swing, the visually intoxicating retrospective at the Whitney Museum of American Art, “Men Without Women” ranks among the painter’s greatest works, too. For while the museum isn’t displaying that particular mural, this exhibition does include at least three related works. Two are preparatory studies from earlier that same year—one in ink, crayon and pencil on paper; the other, in gouache with daringly bold reds and blues. Interestingly or inevitably, Davis, like Hemingway before him, made his own pilgrimage to Paris. There, he also spent time in cafes and soaked up the atmosphere. And while that trip didn’t redefine his style—the techniques he mastered in “Men Without Women” are already glimpsed in his career-defining “Lucky Strike” (1921), which abstracts a single pack of cigarettes—it did inspire some beautiful street scenes, for which he softened his Cubist tendencies without forsaking his signature block-like use of color. Both before and after Paris, an almost Pop Art sensibility pops up in many Davis paintings. You’ll see it in “Odol” (1924), his still life of a mouthwash container predating Andy Warhol’s Campbell’s soup cans, and his “For Internal Use Only” (1944-45), a Popeye deconstruction presaging Roy Lichtenstein’s Mickey Mouse. Davis was, ultimately, an original in the overarching sense of the word. His art originated a new way of looking at our world, one reflecting a distinctively American viewpoint. As Hemingway once said, “Almost no new classics resemble other previous classics.” Check out Davis’s “Men Without Women” at Radio City, or any of the other paintings mentioned above at the Whitney retrospective, and you’ll see exactly what he means. Stuart Davis: In Full Swing continues at the Whitney Museum of American Art through September 25. To see "Men Without Women," take the Radio City Music Hall Stage Door Tour.